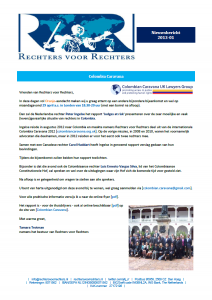 De nieuwe editie van de Rechters voor Rechters nieuwsbrief is vandaag verschenen. U kunt hem hier lezen, voor de bijlage kunt u hier klikken. Judges ought to be more learned than witty, more reverend than plausible, and more advised than confident. Above all things, integrity is their portion and proper virtue. In writing this short preface to this newsletter I am looking back at a week full of activities by Judges for Judges. We have been busy preparing for print a new edition of the booklet ‘Matters of Principle’, while this week also saw the fourth time Judges for Judges met with a new group of trainee judges at SSR, the Study Centre for the Judiciary, and discussed core values, codes and straight-backed judges. Looking forward I am delighted to go and see – as a member of the jury – the films that show at the ‘Camera Justitia Program’ at the upcoming ‘Movies that Matter Festival’, and meet the inspiring guests that will speak at this festival. This newsletter contains relatively a lot of good news, for example about dismissed judges who have been re-instated after years of proceedings and international pressure – including by us. Sadly, we also have to conclude that nothing has changed for the better in the case of Venezuelan judge Maria Afiuni. The executive there does not seem to value a real independent judiciary. The question remains when things will change for the better. In conclusion, I would like to say that by far not all activities by Judges for Judges are related in our newsletter: not every case benefits from publicity. I do want to mention that in the last couple of weeks we have had very constructive talks with the Centre for International legal Cooperation (CILC) and with Justice & Peace about their lovely project Shelter City Netherlands. The talks provided a good opportunity to get to know each other and to see how we could mutually reinforce our activities. I appreciate that you are willing to take the time to read about judges who can (or could) use our support! Judges ought to be more learned than witty, more reverend than plausible, and more advised tan confident. Above all things, integrity is their portion and proper virtue. En el momento de escribir el prólogo de este boletín miro hacia atrás a una semana llena de actividades de JJ. Así estamos ocupados preparando la impresión del librito Matters of Principle. También era la cuarta vez que JJ, junto con una nueva quinta de jueces en formación, en un curso de SSR podía estudiar detenidamente sobre valores claves, códigos y jueces con la espalda firme. Si miro adelante ¡espero con impaciencia las películas que veré por JJ como miembro del jurado del programa de Camera Justitia en los próximos días durante el [Festival Movies that Matter] y a los invitados inspiradores que se puedan ver y escuchar allí! En este boletín encontrará relativamente muchas noticias buenas, por ejemplo sobre jueces que fueron destituidos de sus funciones -por lo cual nos hemos preocupado anteriormente- en Sri Lanka y Ucrania, que después de años de procedimientos y presión internacional han sido restituidos a sus funciones. Desgraciadamente a la vez tenemos que constatar que nada ha redundado en beneficio para la venezolana Maria Afiuni. El poder ejecutivo de momento no parece apreciar una jurisdicción realmente independiente. Queda aún por ver cuando cambiará la situación allí. Por último añado que no todas las actividades de JJ estarán explicadas en el boletín, ya que no todos los casos sacan provecho de la publicidad. Sí quiero mencionar que en las últimas semanas hemos tenido conversaciones constructivas con CILC [Center for International Legal Cooperation, Centro para Colaboración Legal Internacional] y con [Justice & Peace (Justicia y Paz)] sobre su buen proyecto Shelter City Nederland. Eso para conocernos mejor y ver cómo podemos reforzarnos mutuamente. ¡Me alegro que querrá tomar el tiempo de leer sobre los jueces que necesitan (o necesitaban) nuestro apoyo! Descargue el boletín completo [PDF].